Disposable Mascara wand is one of the most versatile makeup tool in the beauty industry. They are available at beauty supply stores as well as from online stores. Take a look at the things your disposable mascara wand can help you do. Eyebrow Groomers – You can use your disposable mascara wand as a brow spoolie to brush on brow products such as gel, pomade and powder. It can also be used to soften the look of penciled-in brows. Mascara Application & Clean Up – Makeup artist use disposable mascara wands to apply mascara on clients for sanitary reason. Pro tip: when removing product out of a mascara tube, always twist the mascara wand inside the tube rather than pumping the wand to prevent mascara drying out. If you find clumps on lashes after applying mascara, use a clean disposable mascara wand and brush thru the lashes to remove the clumps. Root Touch-up – In between visit to your colorist, use a disposable mascara wand and pick up some brow powder or eye shadow and run it on the roots of the hair to touch up as a temporary fix. Cleaning – A disposable mascara wand can reach dust landed in small crevices. Very handy tool to use on camera, tools, around the house and office to clean up those very small areas that a regular cleaning tool can't get to. To Apply Lash/Brow Treatments – Disposable mascara wand makes an excellent tool to apply conditioner to the brows and lashes. Many people condition lashes and brows with coconut oil and castor oil on a daily basis to aid in their growth. There are several different types of disposable mascara wands available on the market. Full Head - They are used for applying on longer lashes and thicker brow hair. It can pick up more product on the bristle. Sphere Head - They are used for catch those hard to reach shorter lashes. 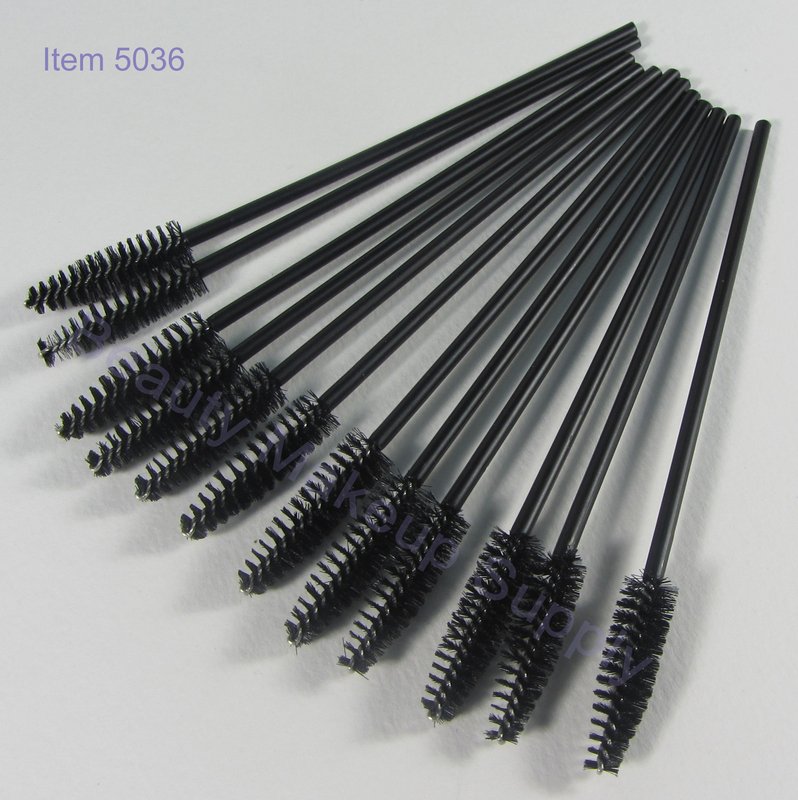 Flexible Handle - Many makeup artist prefer flexible handle disposable mascara wands for more control of application. Lower Lash - Mini mascara wand designed to apply mascara on lower lashes. Visit www.BeautyMakeupSupply.com for a complete listing of all disposable makeup applicators. Inventory available and ready to ship immediately.